Take time out from the rush towards Christmas with an evening of sublime Advent music. Epsom Chamber Choir are delighted to be performing for the first time at St Margaret’s Church, Putney. The Advent season of preparation for the birth in Bethlehem has long inspired composers, and this continues today. 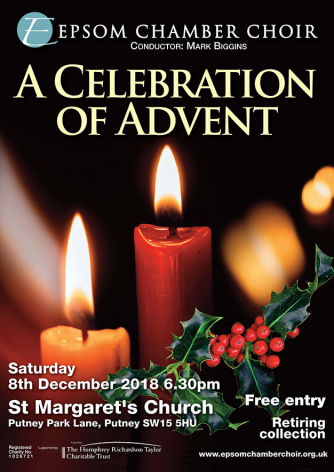 The concert is a feast of spiritual works spanning some nine centuries and also includes pieces by members in the choir, Stephen Ridge and Helen Williams.